NEW YORK (CNS) — What with the glitterati dressing up like all manner of churchmen and saints in connection with the exhibit “Heavenly Bodies,” the Metropolitan Museum of Art’s annual gala has been on the minds of many Catholics lately. And now that event becomes the climactic setting for the elaborate crime caper “Ocean’s 8” (Warner Bros.). With the central figure in Steven Soderbergh’s trilogy of “Ocean’s” films (2001-2007), Danny Ocean, dead, his sister Debbie (Sandra Bullock), a recently released ex-con, takes center stage. Working with her longtime partner, Lou (Cate Blanchett), Debbie assembles a team to pull off the complex heist she spent the long years of her imprisonment planning down to the last detail. 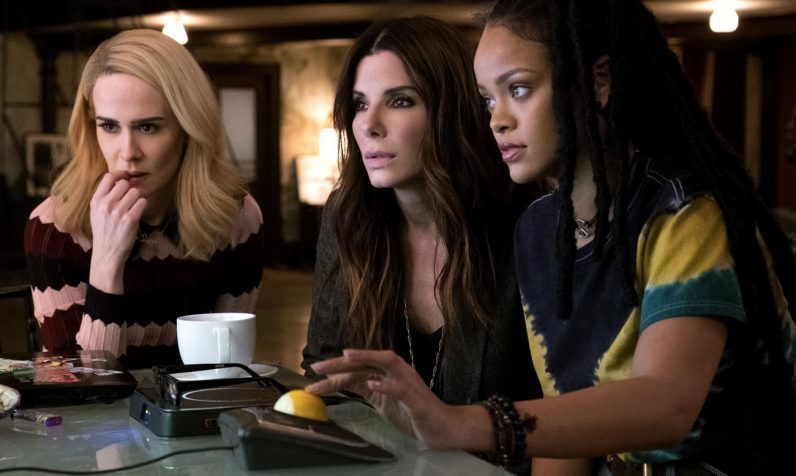 Her crew eventually consists of eccentric fashion designer Rose (Helena Bonham Carter), jeweler Amita (Mindy Kaling), con artist Constance (Awkwafina), Tammy (Sarah Paulson), an experienced fence, and computer hacker Nine Ball (Rihanna). Together they aim to steal the $150 million necklace they must manage to convince Cartier’s to lend movie star Daphne Kluger (Anne Hathaway) for the big evening. Grown viewers willing to treat larceny as nonchalantly as do director and co-writer Gary Ross and his script collaborator Olivia Milch also will get a healthy dose of clever humor and an eyeful of glamor. Less easily sloughed off than the principal theft, however, is a subplot involving the revenge-driven frame-up of Claude Becker (Richard Armitage), the selfish art dealer whose cowardice sent Debbie to the slammer in the first place. This is not a romp for the impressionable since the moral equivalent of suspending disbelief is required to join in the fun. Besides some salty talk in the dialogue, moreover, one plot development depends on Claude’s taste for being bound to his bedstead. The film contains a vengeance theme, a bedroom scene involving handcuffs, brief nonmarital sensuality, drug use, a couple of profanities and at least one rough and several crude terms. The Catholic News Service classification is A-III — adults. The Motion Picture Association of America rating is PG-13 — parents strongly cautioned. Some material may be inappropriate for children under 13.